While the revolution of cryptocurrency is gaining wide acceptance, MeVu, a decentralized peer-to-peer gaming application that will allow players to test their skills and compete individually or in pooled games has arrived. "Though one of the major concern with conventional online casinos is that data such as; gaming results, winnings and payouts are intentionally hidden or partly concealed from public scrutiny. The integration of Blockchain technology into this industry is expected to resolve these concerns and many other problems that the online gambling community has been facing since the extension of gambling business to the internet. Accepting cryptocurrency creates an opportunity for players to venture way beyond there regulatory jurisdictions since crypto is no dependent on regulated payment services. In addition, Blockchain technology will significantly reduce costs associated with withdrawals and deposits to casinos since it eliminates intermediaries such as banks and this will in turn allow players to test their skills and compete individually or in pooled games with no bounds whatsoever." That being said, Mevu uses smart contracts on the Ethereum blockchain to immutably and transparently store players funds and information, providing players with confidence that their bets will be executed securely and quickly. Mevu is a, decentralized, peer-to-peer gaming application that will allow players to test their skills and compete individually or in pooled games. meVu allows players to create custom social bets or bets predicting the outcomes of popular sporting events, including but not limited to: European and American Football, Baseball, Hockey, Basketball, MMA and Boxing. meVu is innovating in the online betting space by facilitating competition between players, testing their skill and knowledge against other people, not a faceless casino or bookie. Mevu is utilizing the power of blockchain technology to allow peer to peer bets in a transparent and secure way to bet against your friends – the platform guarantees security and your money is safely secured on the blockchain which allows quick and timely payments. The platform has lower fees compared to traditional and other blockchain based bets wagering platforms – due to its peer to peer transaction fees are reduced due to the elimination of third parties allowing you access to 100% of your winnings. Online gambling is wagering something of value on the outcome of an event such as sports betting and lotteries, the market is vast and estimated to reach 52 billion dollars this years alone and has been doubling since 2009 – Mevu platform is allowing you to find peers who are interested compete with you globally. Mevu will allow custom bets among peers due to its decentralized nature, where peers will have 100% control of their actions and decisions on the blockchain allowing peer to peer bets wagering without third party regulations. Mevu platform is Ethereum based on an open source platform where everything is transparent through the use of smart contracts allowing consensus agreement between parties involved, the platform will provide tools that will enabled peers to store their resources and the necessary data in a private ecosystem. The platform algorithms will match the data with other peers on the platform and foster competition making betting more intriguing and exciting. 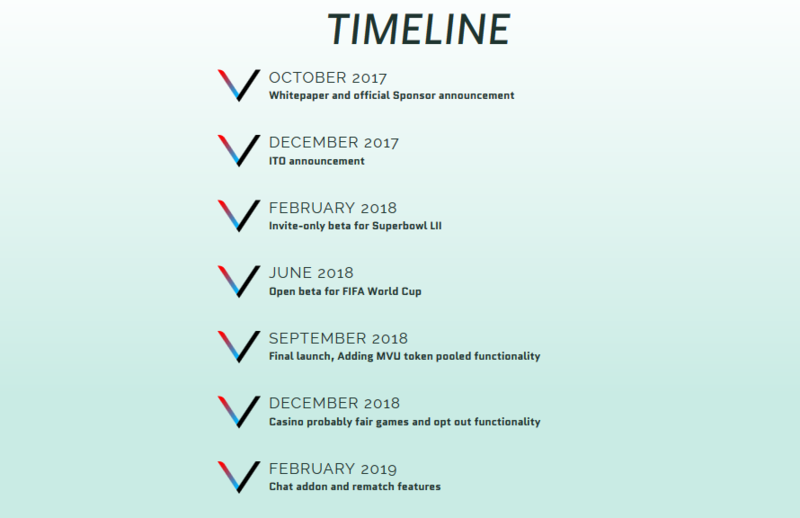 meVu aims to become the most revered global platform made exclusively for players to bet anything, anytime against anyone. 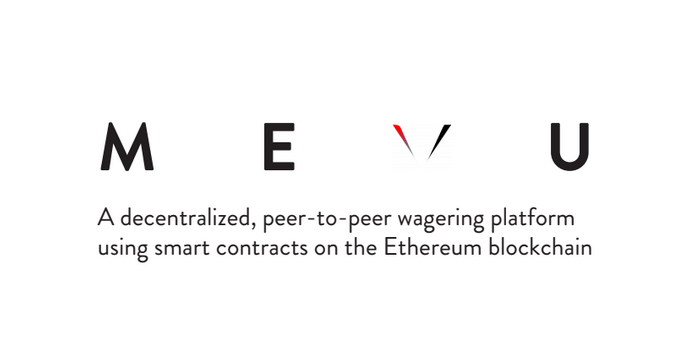 They envision a time when a common phrase could be “Let’s meVu bet!” meVu will initially focus on custom/social and sport head-to-head bets, but will quickly expand to add multi-bets in which multiple players can take the complementary position against a single larger bet. 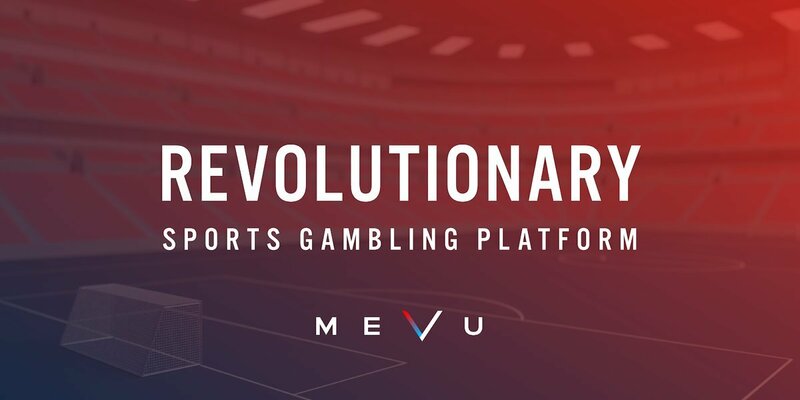 meVu will add exclusive features for our token holders to participate in pooled bets on sports games and provably fair casino style games in which they use the MVU token to play. Finally our API is already in development, allowing existing sportsbook/e-sports wagering sites to use our contracts. The meVu brand is focused on bringing betting back to its basics, between people, the way it was meant to be. Putting control and power back in the player’s hands, we want to foster competition with global leaderboards while heightening the thrill and excitement of betting against other players as opposed to sport bookies. Legalized and regulated sports books enjoy marketing in mainstream channels; however, in order to do so, sports books need to get expensive licenses in every jurisdiction they operate in. Despite paying for these licenses, regulations still prohibit companies from many forms of marketing in the USA, Canada, and Asia. These licenses tend to have a negative reputation and don’t inspire much trust as there are other cases of sports books treating their players poorly and never paying out the winnings. 41% of Americans say they’ve won a bet that’s gone unpaid. Another downfall to traditional sports books is that the initial capital required to support user bets is prohibitively high. The recommended minimum is to have no less than $300,000 with 1 million being the benchmark, and a safer estimate in order to support bets properly. These costs cause sports books to charge high fees, typically between ten and fifteen percent, in order to generate a profit. Alternatively, companies open of shore online sports books which operate in a legal grey area, but the US government is notorious for prosecuting these types of enterprises. In summary, there are many operational, licensing and upfront costs to starting a sports book. Clients are charged high fees to make up for these costs and are also forced to deal with 3rd party institutions who have wait times and fees of their own when redeeming winnings. Users are also forced to trust these third-party institutions with their information and funds. The majority of these sports books exist in a legal “grey” area in order to operate and tap into large betting markets, i.e., USA, Canada, Asia. Players and the operations both run the risk of losing their funds due to regulatory repercussion, security vulnerabilities or exploitation of identity and information. Despite these issues, the online gambling market, both regulated and unregulated, is estimated to be worth at least a trillion dollars per year. 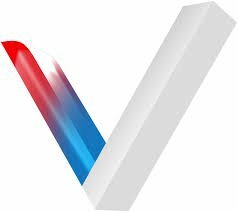 As said earlier, meVu is a peer-to-peer, decentralized application that matches players who agree to odds on a bet. These bets can be centred on a sporting event or users can create custom bets on anything with two possible outcomes. Running on the Ethereum Virtual Machine, meVu’s open-source smart contract creates a secured escrow that is publicly view able. This allows players to follow their Ethereum cryptocurrency “ETH” throughout every step of the betting process. Creating peace of mind that once the winner is determined the Ether will be paid out quickly, securely and automatically. All funds are held within a contract on the blockchain and no individual, company or government can interfere with the payout. meVu virtually eliminates the risk of hacking and regulatory interference as there is no single point of failure in a blockchain network. By clearing payouts on Ethereum, meVu can cut the waiting times of traditional sports books while reducing fees from 10 percent to as low as 2 percent because it is never processed by a bank or any 3rd party institution. The platform pairs people to compete against each other, removing the need for meVu to fund and back bets. Disputes between players on supported sports games are sent to Oracles who are incentivized to reach resolution through consensus. Furthermore, reputation systems and leaderboards foster the spirit of competition and deter malicious behaviour. They designed this platform to run using blockchain technology as the basis for the platform development. From the first appearance, blockchain comes with the offer of fast and secure online transactions and supports all types of data and cryptocurrency. Blockchain technology uses a system, where every transaction is recorded and can not be changed forever, so transaction security and transparency can be maintained and reduce the chance of cheating data. They prefer to use Blockchain technology because this technology is more secure than ordinary technology today. Unlike conventional technology, Blockchain technology does not require a third party, so it's safer and cost-effective. When data is recorded, it will be stored forever and can not be changed. MEVU can be used for two friends to bet on any outcome. Thus, making it a good social app for people who like to foster competitive relationships. MEVU is created like a game where users can bet against each other. This helps reduce the average age for betters from 45 to 38. Want to bet on the next Superbowl? Or the next Olympic Event? With MEVU, it helps you do so! With Blockchain, MEVU helps users by securing their payments and allowing them to process instantly. MEVU allows users to bet at any time and for any moment. Because of this, you don’t have to wait for a booker to start a bet between with your friends. When it comes to sports betting, there are a lot of operational costs and additional fees that must be applied before one can bet for a possible outcome. 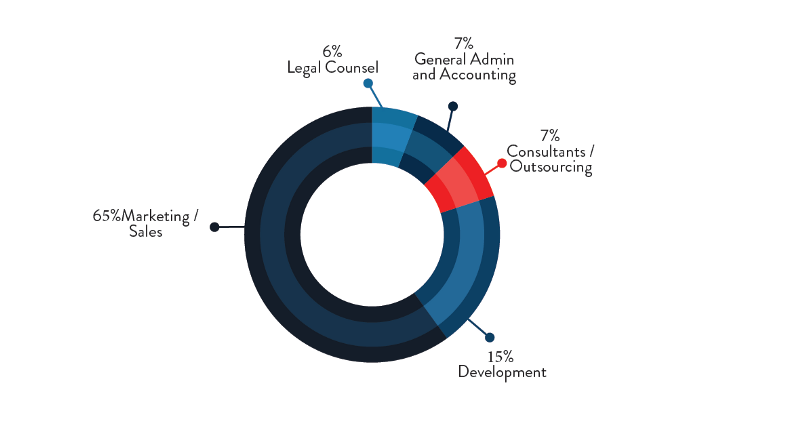 Clients have to pay these high fees because they have to deal with 3rd party institutions. MEVU offers a healthy competition where there is no hacking system like traditional platforms. If you are tired of losing betting, then come on to MEVU .it offers really a healthy competition with the decentralized peer-to-peer system. MEVU offers a peer-to-peer bet. It can be used for two friends who can bet on any outcome. By using this smart social app people who like to promote competitive relationships can be done with promoting competitive relationships through its peer-to-peer bets. MEVU is a social betting platform where anyone can bet against others . In MEVU, there is no strict age limit like other platforms where only players ages from 45 to 38 years are allowed to play. This is really amazing for young bettors. Traditional betting platforms offering bets on running sports. But if you are interested to bet on the next match Or the next Olympic event, then MEVU is the best platform for you.MEVU offers bets on any upcoming sports. MEVU uses a smart contract where players can see current balance of another who is betting from the other side. Also, MEVU uses blockchain technology by which players can get paid faster and instant than any other traditional betting platform. MEVU offers a decentralized peer-to-peer bets prediction system which allows users to bet at any time and anywhere without any third party like the centralized system. This system also eliminates you’re your waiting period to bet with your friends. Mevu platform is powered by its own tokens called MVU that help process payments on the ecosystem, allowing automatic and anonymous bets consensus agreements on the MEVU network. The tokens are an important part of the system and the tokens will be used to wage bets amongst peers. 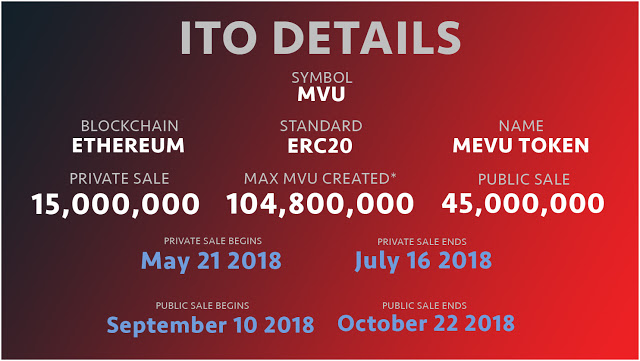 The tokens will also be used to mitigate risk and fraud – you can get MEVU Tokes through the following ways, fulfilling oracle services, transfer from your peers and friends, referrals, staking and winning bets on the platform and sending ETH to MVU creation contracts during ITO. 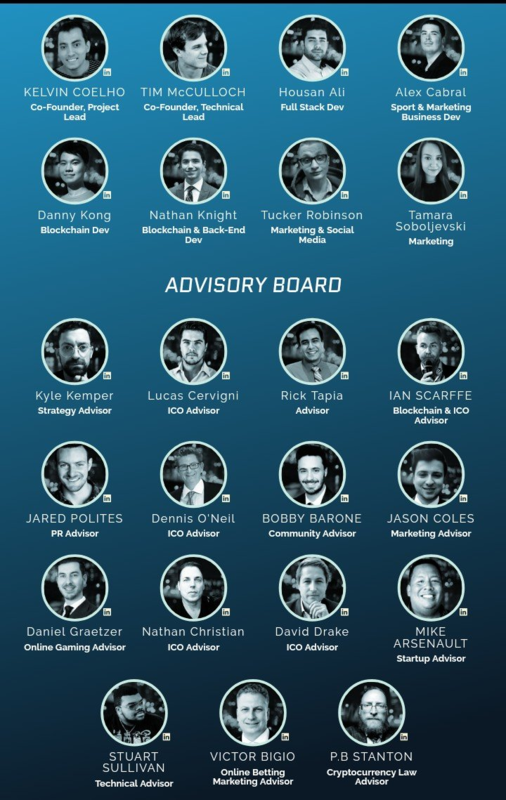 Hi guys let me introduce you to this amazing project called FTEC you see when blockchain technology came, so many things changed, for better, we say. So many businesses have improved, so many companies have started using crypto currencies in their work. The new ideas are coming every day. People want to invest in the new projects. We have the biggest tool in the world, and it is called the Internet. The internet is a enormous base of information where we can do anything. Internet has connected the entire world. One of these projects is FTEC. The revolution of cryptocurrency is amazingly spreading like wide fire and has been gaining a remarkable level of acceptance. While this revolution is gaining wide acceptance,GOeureka, a travel tech company utilising blockchain technology to build a hotel booking platform has arrived. While this revolution is gaining wide acceptance, TOP Network, an innovative and dynamic infrastructure making its emergence with a crucial value proposition to provide significant answers to various degree of challenges and difficulties plaguing public network caused by communication protocols has arrived.